Now, don't get me wrong. I love my Juki. And I love my Singer Featherweight. But my Juki weighs a ton, and is really a pain to carry to class. And my Featherweight does a lovely straight stitch -- but only a straight stitch. Her model name is Jem, but she is named for my favorite Air National Guard boss of all time, Col. Jimmie L. Winders. I learned more about leadership, and more about being a boss from him than from anyone in my entire career. He taught me to drink Miller Lite, how to say "it's my hit" and how to chew someone out and have them thank you afterward. My Jemmie weighs less than 12 pounds and has lots of stitch choices. Plus, she fits perfectly in my red sewing machine roller bag, so I can take her to class without throwing out my back. And half price, who can beat that? Last weekend was the Pueblo Quilt and Stitch Expo. I didn't buy much, but I couldn't resist the modern quilt display put on by the Stitcher's Garden. They had a sample quilt from Modern Quilt Relish, "Picnic." 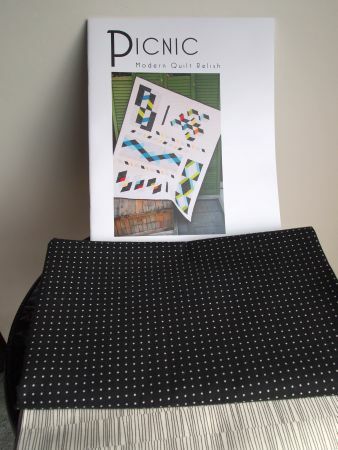 Friend Mary and I want to persuade some of the Front Range Modern Quilters to do this quilt as a BOM at Front Range Modern Quilt Guild meetings. I also scored some collector's Tula Pink, "Full Moon Forest." This little bundle will probably never be cut up, it is just so pretty! Come back tomorrow for "Scrap Basket Sunday." I'm having fun with my Block-a-Day quilt! Wow! That was a great deal on the sewing machine. 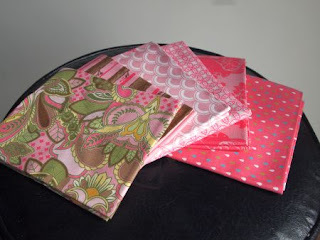 I love the Tula Pink fabrics. You need to make yourself a luxury item out of it if you do cut it up (like a quilted jacket or Amy Butler-style purse) so it won't wear out. Sweet deal on the Jem. 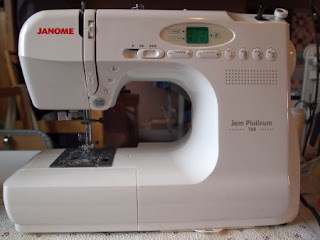 I have one that I use to take class or on the guild sewing day. Works like a charm. Enjoy. Love the Tula Pink! Oooooh, Marti! Great buy. I've been wanting to buy a machine with which I could travel. The fabric with the Picnic pattern-is that a really nice medium weight navy that's been printed? I think it's the same fabric I bought and have used as borders on several of my pieces. Love it and wish I had bought a few more yards actually. What a bargain - it will make classes much easier. Lovely fabrics too. Wow what a great deal. Lucky you and friend. I love those pink fabrics, it wil certainly be difficult to cut into them. Beautiful sewing machine and the pink material rocks!